“Take a giant step…” as the great Taj Mahal once sang… or was it the Monkees: “Take a giant step outside you mind”? In April 1969, as a young art student at Wimbledon School of Art in London, I went to see a big show of abstract art at Tate Gallery: “The Art of the Real; An Aspect of American Painting and Sculpture 1948 -1968”. This was very new and exciting to me back then, and in its way, as I will explain, it still is. This, I think even in retrospect, was pretty good, and was the start of something important for me about how to make “abstract” art, and how to make it “real”. I had by then already abandoned any connections with figurative painting and sculpture of any kind. Five years ago I drafted an article for abstractcritical focussing on the works by Anthony Caro and Katherine Gili in the 2013 RA Summer Exhibition, neither of which I liked. The Gili, a sculpture of complicated forged parts that circulated a central void, with big alien feet and a prop to one side to steady it all, was called “Ripoll”. I had previously shown this work in Poussin Gallery in 2011, though I think Gili amended it slightly before it got to the RA, where it won the Jack Goldhill Award for Sculpture. In the essay I described it as having a banal configuration, to which Katherine took great exception (though I stand by it) and our previously close relations were, and remain, soured, despite my withdrawing the essay prior to publication. If anything, I now think that understates the case. But questions remain: What do we mean by three-dimensionality in sculpture? Do I mean the same as Robert Persey when we both write those words? And what does that “full” mean, before “three-dimensionality? All objects, sculptures or not, are three-dimensional, so are we both talking about something more than the quotidian three-dimensionality of any-thing and every-thing? And is work that references the figure/body able to achieve three-dimensionality in the fullest sense that we can now begin to comprehend it? H-A-R-D-P-A-I-N-T-I-N-G at Phoenix Brighton, 13 January to 11 February 2018. 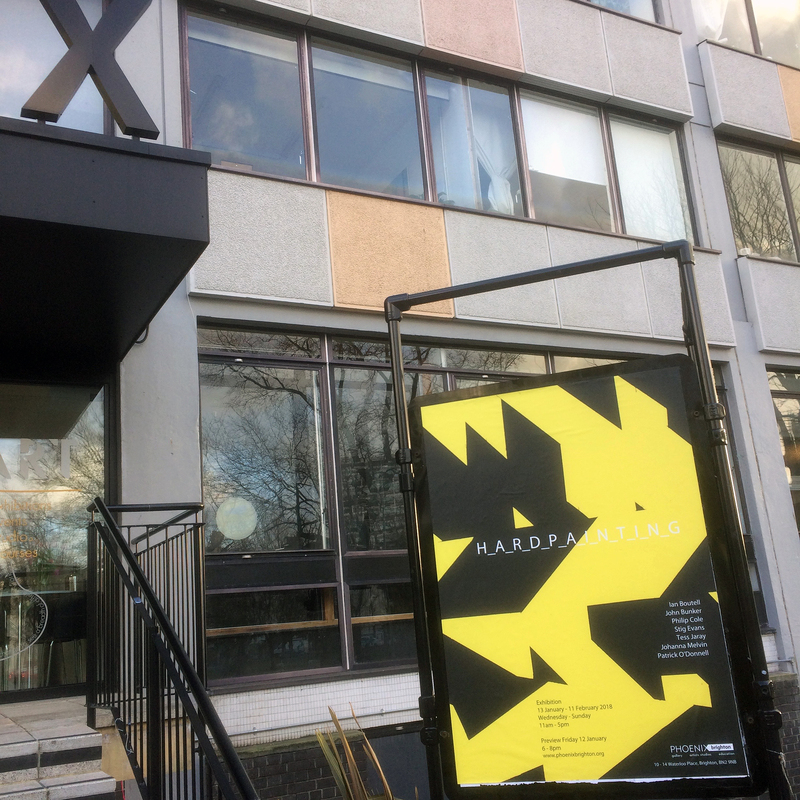 Spaces available to show contemporary art in Brighton are limited, but Phoenix Brighton is undergoing a public engagement transformation that will be further re-calibrated with a refurbished gallery space in 2019. 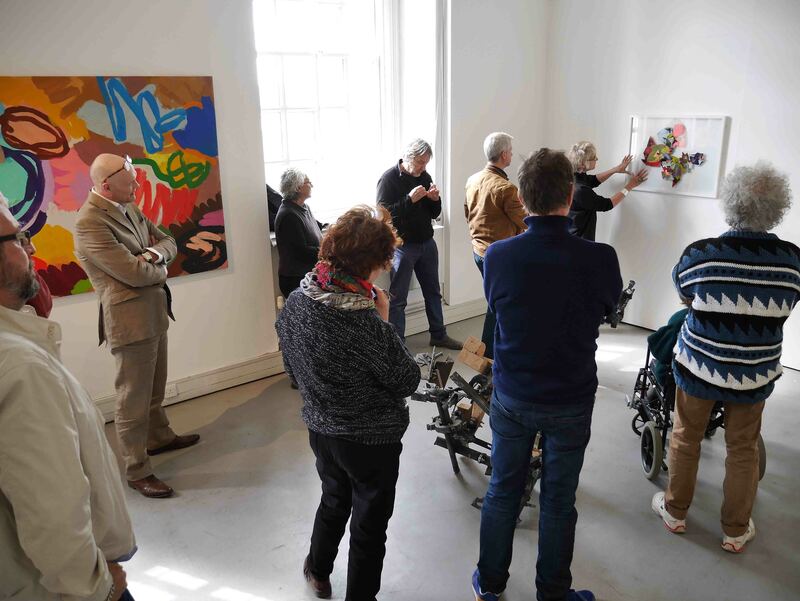 The last significant painting shows here were ‘32 Paintings’ (2013) and ‘20 Painters’ (2014) that showcased a broad range of styles and interests from Sussex based artists and were co-curated by Patrick O’Donnell (with Nicholas Pace and June Frickleton, respectively). During the second exhibition a public discussion event took place with Peter Ashton Jones, co-founder of Turps Banana magazine and art historian Peter Seddon. A lingering memory of that evening was of a rather polite assembly of listeners who did not rise to the bait (if that was the intention) of having the range of work on display described as “Home Counties” painting (aka provincial?). Nevertheless, hopes for an ongoing debate about contemporary art (not just painting) were kindled by this initiative, and rightly so, for the gallery space, with or without a forum, is the most appropriate public arena for a meaningful debate to take place. 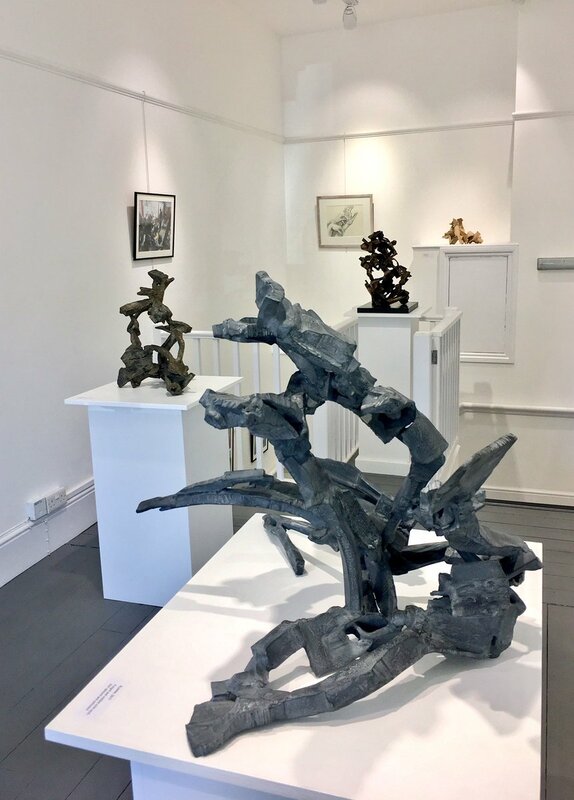 This mini retrospective just finished at Paisnel Gallery gives us some definitive snapshots from a 50 year career – a career that is so difficult to pin down to one particular mode or type of painting. Why is this so? There are some highly focused kinds of chaos and an ongoing drama of contrary painterly forces at work in Garry Wragg’s art. The hang reflected this irrepressible quality of exploration. 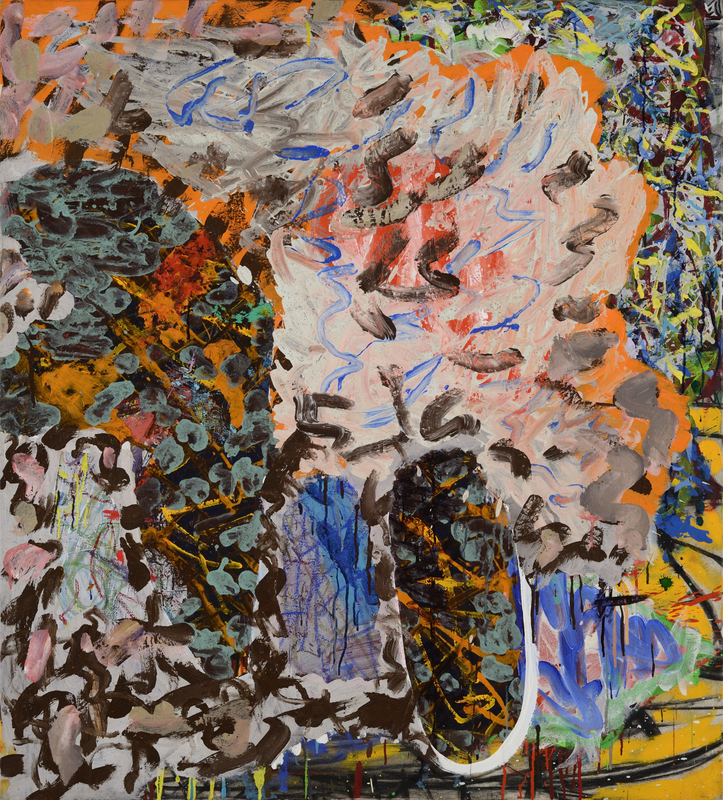 Bringing smaller and larger works from different periods into close proximity highlighted a restless, energetic and searching approach to painting. There seems to be no fear of sudden shifts in focus. I think this suggests an openness to experience and a cooler painterly intelligence honed for ‘in the moment’ decision-making and the revelations that follow. I’m not happy with my own use of terms like ‘chaos’ or ‘forces’. Maybe I could say that Wragg finds visual equivalents for a keen sensitivity to kinaesthestic sensation and energy in his work? Or maybe it’s all about ‘touch’? Paint can act as a conduit for all kinds of impulses. But these impulses are protean and constantly shape-shifting. Paint can catch, direct and release these energies. It can contain contrary inner and outer worlds, sensations and feeling. It can be the medium in which internal and external realities are able to meet – to fuse. Wragg’s art seems in some ways dedicated to this most complex interplay of objective and subjective experience and sensation. 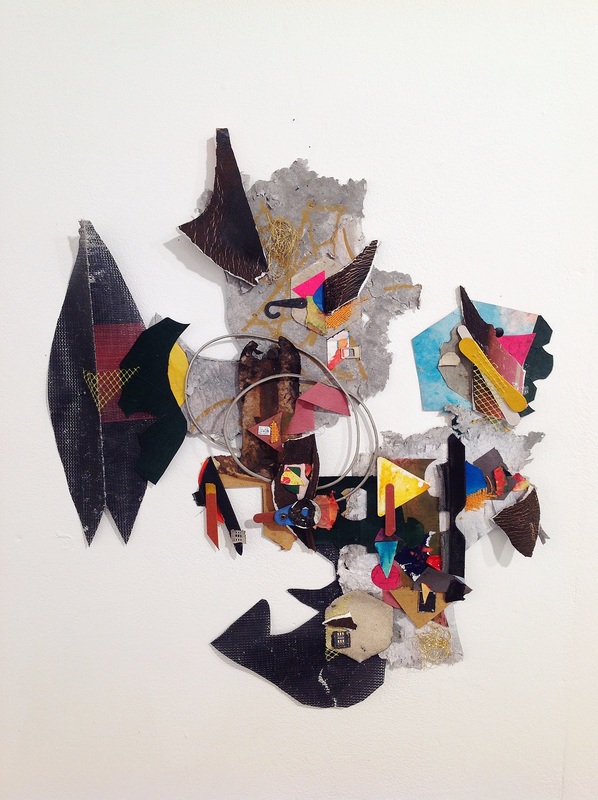 I didn’t visit John Bunker’s recent exhibition with a view to writing a review, but first impressions from seeing evidence of his developing assuredness in assembling and composing collage material have lingered long after the encounter. Walking around the studio sized space at Unit 3 to explore these latest works, of which 14 were shown, there was no pressure to think of anything that should be noted down. A freedom to indulge in just looking, with unspoken thoughts and without the obligation to describe, explain or ruminate for the benefit of others was a bonus I had enjoyed. But, as title of the show directed – I just could not Leave It. A week later, I found myself jotting down thoughts in a notebook that ultimately insisted on further development. 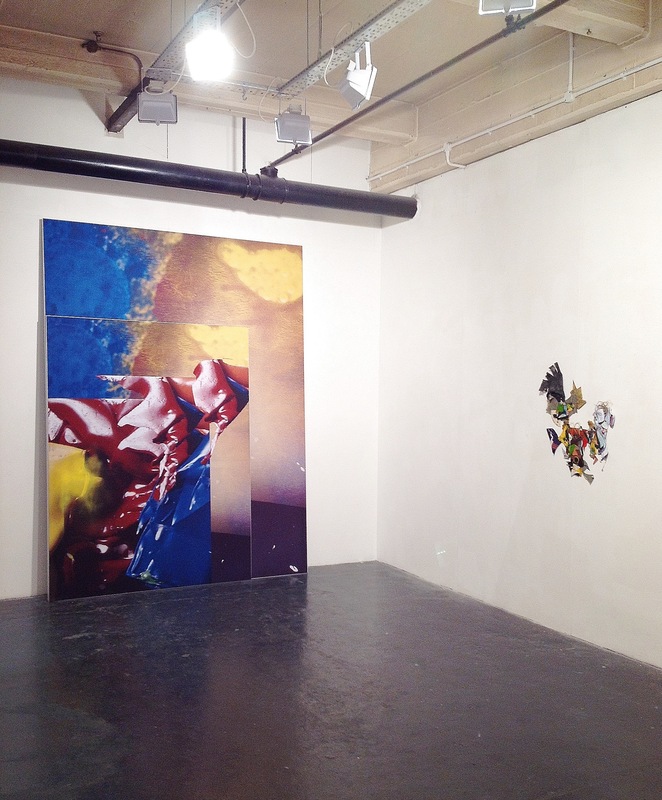 Still enamoured with a refinement that I do not normally associate with collage (although Francis Davison’s abstract compositions demonstrate great skills of placement and composition that remain exemplary) many of Bunker’s pieces were both impressive and memorable. The formal elements of line, colour, shape arrangement and distribution certainly fused into a sense of ’rightness’ and I was reminded that collage is not a substitute for painting. Collage is a broad and flexible medium and a process that lends itself to abstraction as equally as it does to the surreal juxtapositions explored within figurative realms. 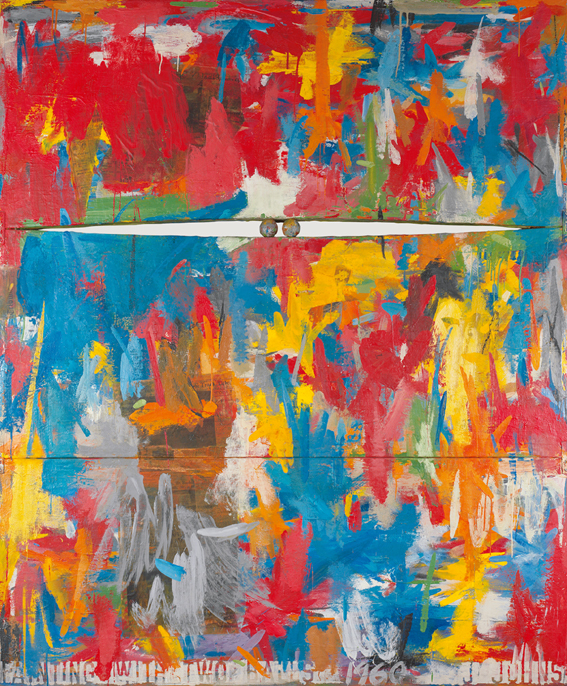 Jasper Johns, “Painting with Two Balls”, 1960, encaustic and collage on canvas with objects (three panels). 165.1 x 137.5 cm. Collection of the artist © Jasper Johns / VAGA, New York / DACS, London 2017. Photo: Jamie Stukenberg © The Wildenstein Plattner Institute, 2017. The title of this show is ‘Something Resembling Truth’. These particular words have been hacked away from a longer ponderous statement by the artist and to get the ball of conundrums rolling in that all too familiar cold blooded Johnsian manner – you have to ask – what does that really mean? What ‘truth’ are we talking about here? A truth about painting? A truth about life? Surely all that ‘life’ business is just conjecture? And how do we go about ‘resembling truth’ or life or both? Is not this title just adding to an already monstrous scatter of ‘truisms’ and ever multiplying thick coffee table tomes full of puff? Just as a shaman scatters her bones, does not a twitter-feed sometimes appear a wreck of truisms, a random cast of signs and signals, warnings and affirmations, all back lit on our tablets with a tinge of desperation? But the real shaman’s signs and emblems would have specific meanings. Interpretations of predicaments and predictions would then be based on such criteria as, where the chosen objects fell when they were thrown, in what combination: upside down, eschewed or perfectly aligned? Even the shadows they then cast could be ripe for interpretation by the initiated and knowing eye. And Johns gives us the continual recasting of reccurring motifs and signs upon the canvas – an apparent randomness of objects and images, some of which we all know and, in our own way, we have internalised. The paintings then seem to take on a sort of weight and seriousness of official insignia almost perfectly designed for the catch-all we call ‘Modern Art’, supplying it with its very own Johnsian coat of arms. Flag, target, crosshatch, skull, paintbrush and lightbulb for instance, in whatever combination is desired. 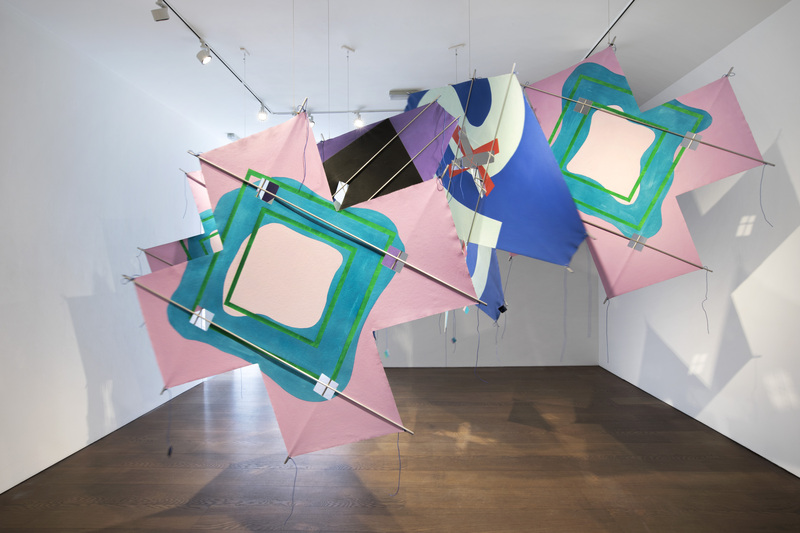 Richard Smith – Work of Five Decades is as rich and tantalising a show as it is modest and partial. Well chosen combinations of work signal original and singular twists and turns across Smith’s career. It was a chance to get up close to some of the later more delicate and intricate works loosely coming under the rubric of the “Kite” paintings. But there were also the more robust deliberately awkward painterly works that play explicitly with the grid and illusions heightened by intense colour-play. These contrasts and continuities in approaches did not disappoint – but in ways totally unexpected. Peter Lamb, ‘A Slow Gaze Charged’, 2017; John Bunker, ‘Frenhofer’, 2017. “Unnatural Vibers” at Unit 3 Project Space, ASC Studios, London is open 2-5pm., on the 6, 7, 13, 14, 20, 21 of May 2017, or by appointment. 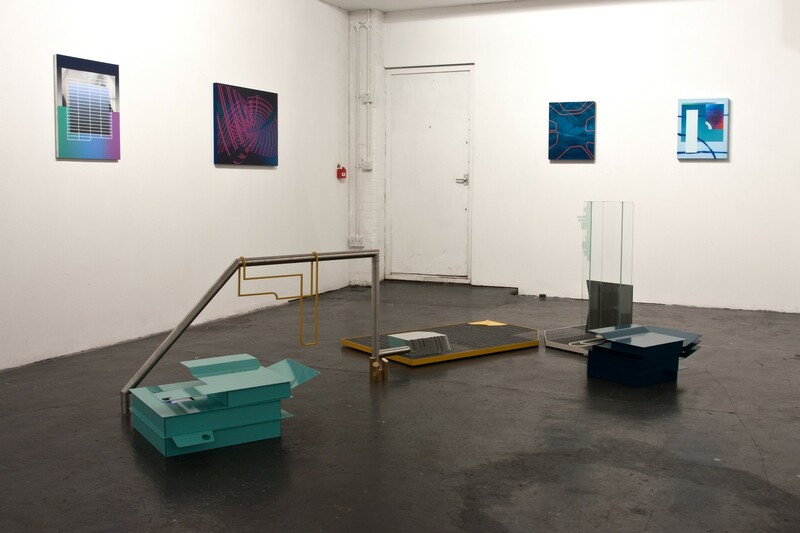 Following the TESTING <1<2<1<2 group show at ASC studios a month or so ago, artist/curator John Bunker has devised another intriguing showcase to mix things up. This time he is co-curating with artist Michael Stubbs and together they selected painters who share a compulsion, not just for the construction or devising of the abstract image, but also for a generally speculative and performative rather than planned approach to image making. Initially, Michael Stubbs, Dominic Beattie, Vicky Wright, Peter Lamb and Bunker himself may not seem like an obvious combination. But even a relatively small show of this kind (just nine pieces) provides a potpourri of sorts, and proves that diversity can gel successfully where a common thread of serious endeavor and an ability to formulate a primary visual impact, is paramount over associative, figurative narratives. Their work shares a sense of questioning through a building process and of the construction of the pictorial image to act as a trigger for the viewer to adjudicate from. As the various constructional processes unfold, with collage and paint, traces of earlier decisions are superseded, but not entirely replaced or buried so as to preserve a sense of history or a past state that can still contribute to an evolving situation. A collage aesthetic, and means of realisation, enables past, present and future to combine or collide. The future, it could be argued, is present in the viewing of the image and the onlooker’s response.